Fred Phelps, the founder of Westboro Baptist Church, has been a controversial figure in American Christianity. 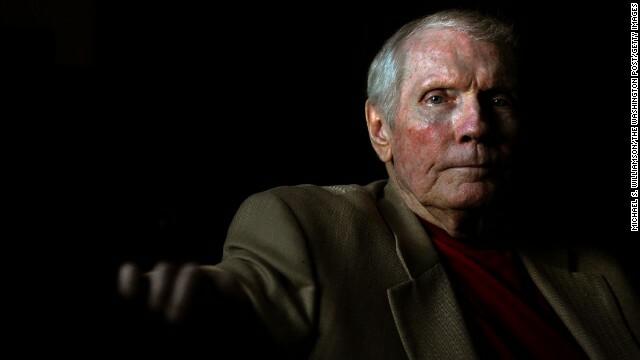 (CNN) - Westboro Baptist Church, the Kansas congregation known for picketing funerals with anti-gay signs, called reports that its founder, Fred Phelps, is near death "speculative." "Fred Phelps has health issues," the church said in a statement Sunday, "but the idea that someone would suggest that he is near death, is not only highly speculative, but foolish considering that all such matters are the sole prerogative of God." Nathan Phelps, the estranged son of Fred Phelps, posted a Facebook message Sunday saying his father was "at the edge of death" at a hospice in Topeka, Kansas, where Westboro Baptist Church has long been a controversial presence. Nathan Phelps also said his father had been excommunicated from the church. "I'm not sure how I feel about this," he added. "Terribly ironic that his devotion to his god ends this way. Destroyed by the monster he made." Westboro declined to say whether or not its patriarch has been excommunicated. The church's statement said that "membership issues are private" and that eight unnamed "elders" lead the Westboro congregation. A church spokesman declined to respond to follow-up questions. Fred Phelps founded Westboro Baptist Church in 1955 and molded it in his fire-and-brimstone image. Most of the small congregation are members of Phelps' extended family. Nathan Phelps is one of several relatives who left the church in recent decades. He lives in Canada, according to his Facebook page. Despite its "Baptist" name, Westboro is not affiliated with any larger church denomination. Most Christians criticize the congregation's harsh anti-gay rhetoric and penchant for pursuing the limelight at inappropriate moments. According to the church's website, it has picketed more than 53,000 events, ranging from Lady Gaga concerts to funerals for slain U.S. soldiers. Typically, a dozen or so family members - including small children - brandish signs that say "God Hates Fags" and "Thank God for Dead Soldiers." Westboro's website keeps a running tally of "people whom God has cast into hell since you loaded this page." By the church's idiosyncratic logic, God's damnation, including the death of U.S. soldiers, is the price to pay for the country's acceptance of "sins" such as homosexuality. Despite the protests' unpopularity, the Supreme Court upheld Westboro's right to picket military funerals on free speech grounds in 2011. Several states, though, have passed laws aimed at keeping the controversial church at a distance from funerals. "I feel sad for all the hurt he's caused so many," Nathan Phelps said of his father on Sunday. "I feel sad for those who will lose the grandfather and father they loved. And I'm bitterly angry that my family is blocking the family members who left from seeing him, and saying their good-byes." Next entry »Will American Jews back Hillary? Freedom of speech may be one of the most over looked privileges in America, But some groups are well aware of there rights and how far they can almost cross the line. The WBC first gained widespread publicity in 1998, when members of the church, located in Topeka Kansas, picketed at the funeral of a man named Matthew Shepherd, a young college student who was was murdered because he was gay. Even though they call themselves “Baptist”, their extreme ideology sets them apart from any other Baptist church; critics have described the Westboro Baptist Church as a hate group. Critics have also said that the WBC members just want to receive large amounts of attention. In 2006, WBC picketed the funeral of a soldier named Matthew Snyder, who was killed in Iraq, with signs saying, “Thank God for Dead Soldiers”. The WBC was brought to court were they were eventually not charged for this hateful act mainly because of the first amendment. The best thing anyone can do is ignore them and let them have their opinions.